Pamper that special someone with the ultimate gift from Khloe & Lamar. Give the gift of togetherness, with the exclusive Unbreakable Love by Khloe and Lamar. A lively fragrance that will withstand the test of time, just like the romance that inspired it. A unisex fragrance, Unbreakable Love is designed for a man or a woman. 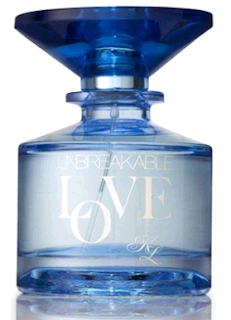 Their newest fragrance, Unbreakable Love represents the next evolution in Khloé and Lamar’s love story. This fragrance was created to remind couples that the most valuable thing you can hold on to in life is each other. It's hard finding a fragrance that you like and your husband (significant other likes). So I was excited to get the Khloe Kardashian Unbreakable Love Fragrance, since it is meant for men and woman. Unbreakable Love comes in a beautiful blue bottle and really is a timeless fragrance that both my husband and I love. This will be a great fragrance to share with friends and family as gifts. With Mother's and Father's Day coming up you have a wonderful fragrance to give either. You can find Unbreakable Fragrance on Light House Beauty for $45.00.